English philosopher; one of the chief expounders of utilitarianism; noted jurist and author of Introduction to the Principles of Morals and Legislation. 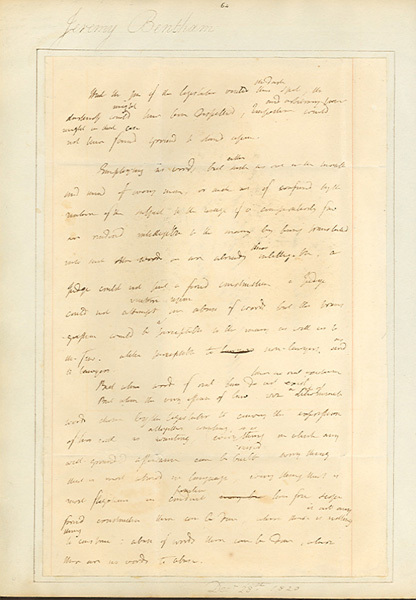 Autograph Manuscript, full page, legal folio, undated, [December 28, 1820.] 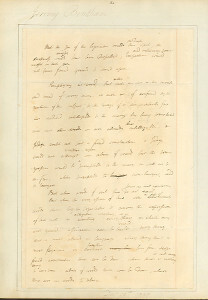 Twenty-three lines of notes in Jeremy Bentham’s hand concerning interpretations of the law, with additional corrections and revisions, also in his hand. Accompanied by an address panel written by Jeremy Bentham and bearing his signature. Fine condition.